But does anyone really ‘own’ Whitlam’s legacy? Whitlam was a unique figure in Australian politics. His transformative leadership heralded the birth of a new Australia. Indeed, many of the causes and reforms he championed – while controversial and hotly contested at the time – now enjoy almost universal support. No fault divorce, abolition of the death penalty and lowering the voting age to 18 are among them. Others, however, have been disowned by the Labor and Liberal parties. Free education, a Whitlam initiative for instance, was abolished by Labor when it introduced the HECS scheme and is no longer part of its policy agenda. 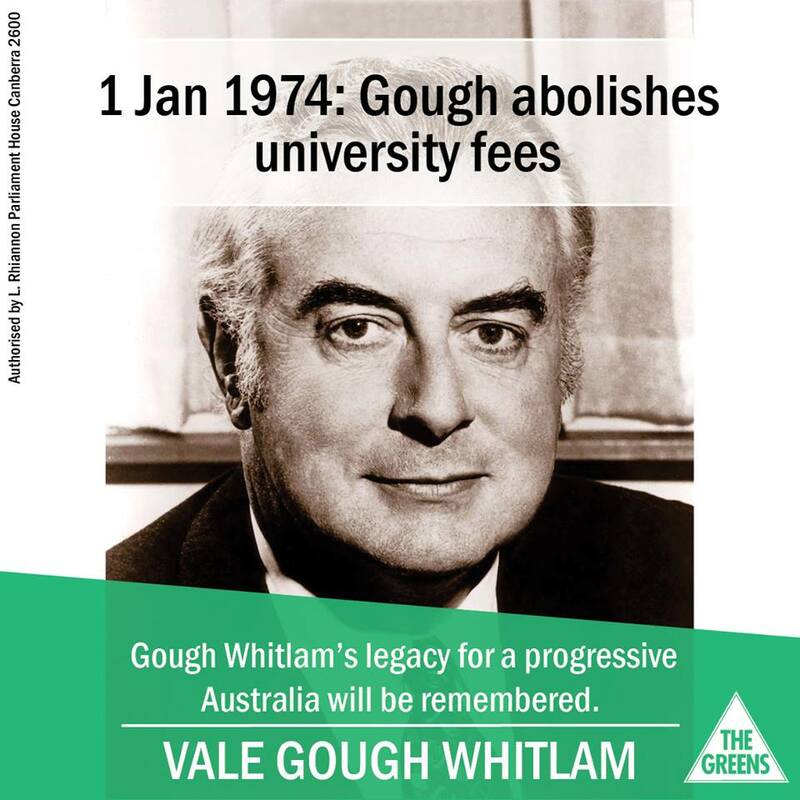 Indeed, the Greens are the only party in the Parliament to support this signature Whitlam policy. Meanwhile, the Liberals have mounted an assault on the principle of universal health care in this year’s federal budget. Whitlam represented a style of visionary, conviction politics that many voters yearn for in today’s age of craven politicians, opinion polls and spin doctors. He is a powerful reminder of what can be accomplished when leaders are bold enough to reach for the stars. The power of politics to change lives for the better and to make our world a better place. In many ways, the Greens are the beneficiaries of this tradition. A repudiation of stale conservatism, they are the modern face of progressive politics. Much like the Labor Party of the 1970s, the Greens enjoy support from social movements and activists who want an end to business as usual. With their support for public services and a bold social agenda, the Greens occupy a unique space on the political landscape – one that is surely more Whitlamite than modern Labor. Meanwhile, the two major political parties continue to converge on fundamental social and economic questions. While a progressive, tertiary-educated middle-class once underpinned support for Whitlam Labor, today this demographic is largely associated with the Greens. For many, their support of the minor party is a contemporary expression of the values that were once so clearly articulated by Labor under Whitlam’s leadership. In paying tribute to the former prime minister, the Greens are joining the rest of the nation in celebrating the remarkable contribution of a man whose values are supported by progressives across the political divide. Whitlam is a Labor icon, but surely his legacy belongs to all those Australians who seek to “maintain the rage” by fighting for what he stood for. This article was first published on the ABC’s The Drum on 22 October 2014.